The Universal Declaration of Human Rights affirms access to adequate housing as a vital part of human rights. The Six Dimensions of Housing Adequacy is used by Statistics New Zealand, and Habitat for Humanity CNI to describe and identify what we mean by a “decent” place to live. General Manager Nic Greene outlines the tenets of each dimension, this edition: Habitability. Whether a home is healthy to live in is a key component on determining ‘habitability’. condition of the environment surrounding the home. There’s significant evidence to link habitability with health. And in New Zealand we know that people – especially the very young, elderly or those with serious existing health conditions – struggle to maintain good health while living in a house that’s cold and damp. For good health, people must maintain an internal temperature between 18 and 21 degrees Celsius. Those who live in a ‘cold’ home regularly have temperatures well below, and some would never be close to this guideline. Among the families Habitat meets, the cold is made worse by poor insulation, and a lack of cost-effective heating. Alongside habitability issues created by temperature, damp homes are directly linked to respiratory illnesses and immune system damage, particularly for children and the elderly, and this is well documented in New Zealand. Large families and the use of unducted gas heaters lead to major issues in Kiwi homes. We see mould and mildew, signs of rising damp from poorly ventilated foundations, and lack of mechanical ventilation. Habitat CNI helps families with Assisted Home Ownership, provides social rental options, and the area of Home Repair is steadily growing. Often through referrals from health partners, we meet homeowners who can’t afford necessary repairs or maintenance, and as a result, habitability is severely compromised. 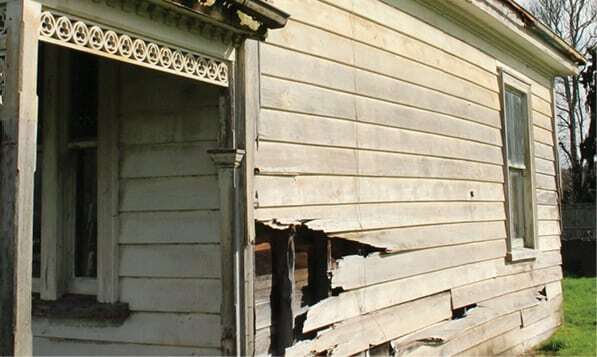 The New Zealand Building Code refers to the life of a building being “not less than 50 years” with “only normal maintenance”. This excludes some non-structural elements, which it requires to last, in some aspects, for just five years. For many families, “normal maintenance” has been unaffordable or unachievable. Some houses we see have compromised habitability because of overcrowding. Some are old, really poor houses where there is overwhelming mould and leaks. Electrical wiring or plumbing may have failed; perhaps rotted floors, window framing and walls. A lot of these houses are more than 50 years old, but some are not. support policy that increases access for all people to “decent” housing. If this is to be a world where everyone has a decent place to live, it must be a world where housing is habitable and has secure tenure, is affordable, suitable, and free from discrimination and crowding. These are the Six Dimensions of Housing Adequacy which are unfortunately not achieved for an unacceptable proportion of New Zealanders, as we see it. The more we can understand the principles that enable these dimensions, the more successful we can be to move forward. Affordability, suitability, habitability, free from crowding, free from discrimination, security of tenure.